Class action suits have been filed against eight unions in New York, New Jersey, Pennsylvania, Minnesota, Maryland, California, and the state of Washington, accusing individual unions of violating workers' rights by collecting mandatory dues payments. The Supreme Court is expected to rule on a groundbreaking case, Janus v. American Federation of State, County, and Municipal Employees, which challenges the constitutionality of forcing public-sector workers to pay union dues or fees as a condition of employment. The suits argue that any public-sector employee who participated in forced dues systems should receive financial "redress" from labor organizations. "The defendants have violated the class members' constitutional rights by forcing non-union members to pay compulsory ‘representation fees’ to the Maryland State Education Association (MSEA) or its affiliates as a condition of their employment," the Maryland complaint says. Similar language is featured in all eight lawsuits. "The compelled subsidy that [plaintiff Ruth Akers] and her fellow representation-fee payers must remit to the MSEA as a condition of their employment violates their constitutional rights." Former Texas solicitor general Jonathan Mitchell, who has argued four Supreme Court cases in the past, filed each of the suits. Mitchell declined to comment on the suits, instead directing the Free Beacon to court filings. Seven of the eight unions named in those suits did not return requests for comment. A spokesman for Education Minnesota declined an interview, referring the Free Beacon to a Thursday press release posted to its website. The union decried the suits as part of a coordinated attack sponsored by "a few immensely wealthy individuals." Union president Denise Specht said the union's dues collection practices were in accord and in compliance with all state, local, and federal laws and abided by the 1977 Abood decision, in which the Supreme Court affirmed mandatory dues payments as constitutional. "For the past few years, a few immensely wealthy individuals have paid for a national campaign against the rights of working people to organize and work in union. They fund lawsuits, political campaigns, and think tanks in every state," she said in a statement. "Education Minnesota always complies with the law, and the collection of fair-share fees has been legal and beneficial for the tens of thousands of educators who worked in better schools, with smaller classes, and for more pay than they would have without their union." A veteran labor lawyer familiar with one of the cases, who requested anonymity to candidly discuss legal strategy, said the suits could prove devastating to unions, who are already at risk of losing hundreds of millions of dollars in dues money if the justices rule in favor of the plaintiffs in Janus. He argues that labor organizations do not enjoy qualified and sovereign immunity protections that government agencies enjoy. They could also be forced to pay legal fees if the class-action plaintiffs emerge victorious. "We are seeking to return improperly seized wages for these workers—it's a terrible situation," the lawyer said. "There's a good chance they're going to be hit for refunding all these fees because it is a constitutional violation." Similar suits have followed other Supreme Court rulings on the subject of forced dues payments. In 2014 the Court declared an Illinois policy forcing home health aides to pay dues to SEIU unconstitutional, sparking a Right to Work Foundation lawsuit seeking to recover back payments. A lower court dismissed the suit and an appeal has been filed to the Supreme Court. Patrick Semmens, a spokesman at the National Right to Work Foundation, which represented the Janus plaintiffs before the Supreme Court, said such suits may send a warning to unions tempted to work around the Supreme Court's decision. He expects such cases to spread in other states if the justices rule in favor of the plaintiffs. 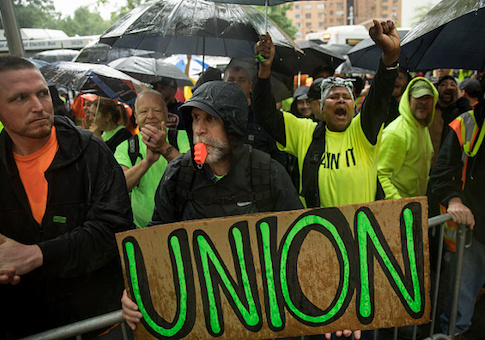 "As we've seen in assisting workers exercise their rights in new Right to Work states, union bosses will fight tooth and nail against letting [them] exercise their rights to stop funding a union they disagree with," Semmens said. "So we expect that a Supreme Court ruling for Mark Janus will likely make necessary numerous new cases brought by state workers across the country seeking to enforce their First Amendment rights."